Coral reef fishes, including clownfish, display a wide variety of colors but it remains unclear how these colors evolved or how they develop throughout a fish's life. Research published in BMC Biology sheds new light on the evolution of different stripe patterns in clownfish and on how these patterns change as individuals from different species grow from larvae into adults. Dr. Vincent Laudet, the corresponding author at Sorbonne University, France said: "We show that the ancestor of today's clownfish possessed three white stripes. Then, as some species evolved they lost stripes and we reveal a surprising similarity between this loss of stripes during species evolution and the development of different stripe patterns in individuals from different species today. " Studying two species of clownfish - Amphiprion ocellaris and Amphiprion frenatus - that have three stripes or a single head stripe, respectively, the authors found that shortly after hatching, the larvae of neither species had any stripes. Subsequently, both species acquired stripes on head and trunk at the same time, with A. oscellaris acquiring a third stripe near the tail and A. frenatus losing the trunk stripe before reaching adulthood. 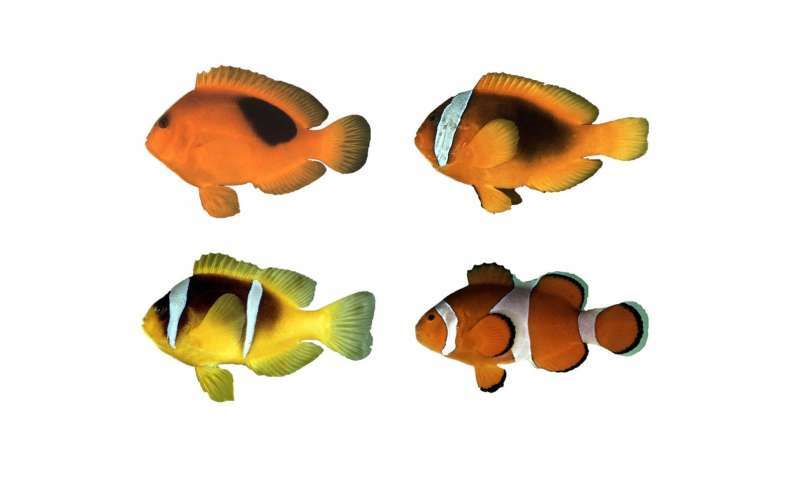 Examining development information for 26 additional species of clownfish, the authors observed that at least nine species have more stripes as juveniles than they do as adults, which prompted the authors to investigating the development of stripes across the evolution of clownfish. Dr. Laudet said: "Interestingly, every clownfish species existing today gains stripes from front to back after they are born, before individuals of some species lose stripes again from back to front as they grow into adults, which is similar to the loss of stripes observed during clownfish evolution; while all clownfish started out with three stripes—that is their last common ancestor had three stripes—as they diversified into what are now 30 different species, some clownfish lost stripes in a pattern that is similar to how today's clownfish lose stripes as they grow up." Dr. Laudet added: "It is also interesting that while clownfish species vary in their number of stripes from zero to three, there is limited variation in how these stripes are organised. In all two-striped species, the stripe nearest the tail has been lost, while the head and the trunk stripes are retained. All one-striped species have retained the head stripe and have lost the trunk and tailfin stripes. So, some fish have no stripes at all, while others have one stripe near the head, one stripe each near the head and on the trunk, or three stripes near the head, on the trunk, and near the tail, but you will never find a clownfish with just one stripe near the tail, or one stripe near the tail and one near the head." In order to investigate the molecular mechanisms that underlie stripe formation and loss, the authors treated clownfish larvae with a substance known to suppress stripe development in zebrafish. The substance works by targeting certain receptors in iridophores; the cells that produce a reflective/ iridescent color. The authors found that larvae treated with the substance did not fully develop stripes or developed no stripes at all in a dose-dependent manner. The findings suggest that the white stripes in clownfish are produced by iridophores and that a decrease in the number of these cells will inhibit stripe formation. Dr. Laudet said: "Because coral reef fishes provide examples of complex color patterns, they offer a unique opportunity to better understand the origin of these traits. 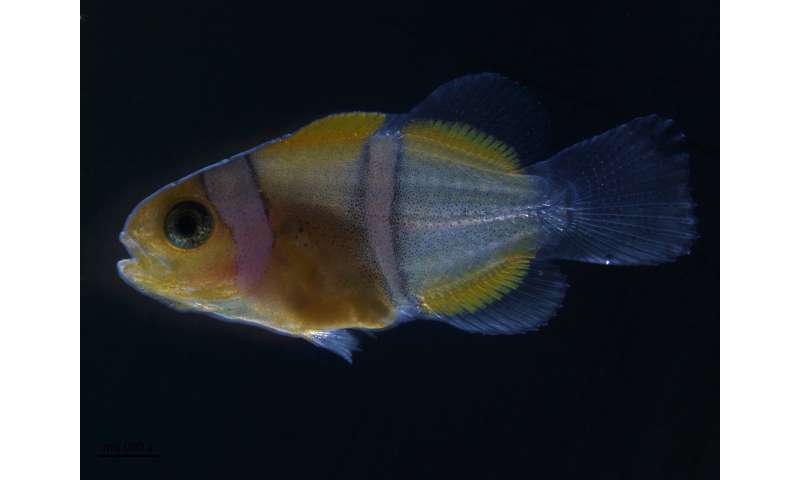 Unraveling the mysteries of why pigmentation patterns from coral reef fish are so diverse, how they evolved and where their diversity originated will help us to understand the formation of very complex phenotypes." The authors also suggest a possible purpose for the different stripe patterns; they may allow clownfish to recognize individuals belonging to the same species, including potential partners for reproduction.